Better Question: Why Did it Last So Long? For a project that was turned down for a federal loan 7 times and, despite what proponents insisted on for over 10 years, had no one but the state holding the bag when toll revenues fail to measure up, the tougher question to answer may be why it was allowed to last so long. Over $100 million in state and federal funds were spent before the project was finally canceled by the Governor. This web site has been maintained since 2007 to provide the public, media, and transportation planning professionals detailed information about the project. This final post summarizes the perspectives of those who fought the bridge for 12 years on why the project failed; and what lessons can be learned about how public processes function or do not function. Three key assertions for the bridge did not stand up to scrutiny. The original justification for the Bridge was to lessen congestion on the Glenn Highway and decrease travel time between Anchorage and the Mat-Su Valley. These arguments quickly unraveled when critics unearthed a simple map from Knik Arm Bridge and Toll Authority’s (KABATA) own traffic consultant (http://www.knikbridgefacts.org/images/maps/wsafigure5.gif ) showing motorists would save 11 minutes of time by taking the existing, free, Glenn Highway from downtown Wasilla to downtown Anchorage compared to a $5 one-way-tolled Bridge. And of course the Glenn was a better choice coming from Palmer and much faster if the trip from the Valley ended at the military bases or midtown rather than downtown. Leading proponents of the Bridge, including Representative Mark Neuman (R-Big Lake), consistently claimed the private sector stood ready to invest hundreds of millions to launch the project. But the Public-Private-Partnership (P3) model (supported most strongly by Republicans in the Legislature) was ultimately scrapped because the P3 “Partners” wouldn’t invest their own money if they had to get paid from what the Legislative Budget and Audit Committee called “unreasonably optimistic toll revenues” alone. Legislators filed bills, fortunately never approved, that would have required the State to write endless “blank checks” to cover shortfalls. The details changed from year to year as KABATA came up with new financial schemes to try to back up their promises of it being a “free bridge, paid for by toll revenues”, but, as an example, in KABATA’s 2011 P3 financial “Pro-Forma”, the foreign contractors would “invest” only $76.8 million of their own money… and receive $914.6 million back in state guaranteed payments. Unfortunately, every bridge bill introduced directly put the state’s credit rating at risk by guaranteeing an unlimited amount of “availability payments” to the contractor or indirectly through an unlimited moral obligation to cover the toll shortfall necessary to repay federal and state loans. Even after the Governor canceled the project, Rep. Neuman, the co-chair of the House Finance Committee, continued to wrongly insist that the private sector was holding the downside risk of any toll shortfall. Population projections are used to project trips and therefore the tolls that are a key part of any project finance plan. The three different population studies commissioned by KABATA from out-of-state firms produced numbers showing a future Mat Su with 50-60% more residents than projected by either UAA’s ISER or the state’s demographer. First, KABATA hired the little known firm Insight Research Corporation of Dallas Texas to estimate the Mat Su Borough would have 250,700 people by 2030. Their long report was largely ignored by State and Muni planners until a person sympathetic to the critics’ cause (the “first whistleblower”) pointed out the buried 250,700 number. The bridge critics then told anyone who would listen that the Borough would have to add the equivalent of Palmer, the Borough’s second-largest city, to the Borough every year for the next 23 years to get to 250,700 people in 2030. Then, pressed for a more realistic number, KABATA hired consultant Wilbur Smith to estimate that the Borough would grow from its 2010 Census population of 88,995 people to 204,000 people by 2035. 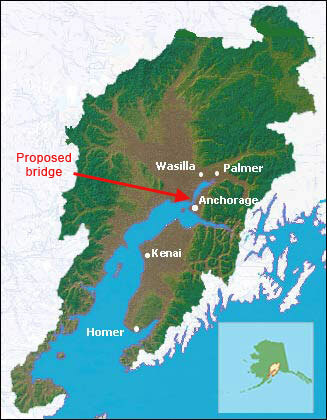 Wilbur Smith shoved future Borough growth away from the Palmer-Wasilla core to the unpopulated Point MacKenzie area (the western terminus of the proposed bridge) where Smith projected 13,828 jobs in 2035. For context, note that number was more jobs than the Kenai, Juneau, or Mat Su Boroughs have today. Viewed another way, Wilbur Smith had placed the employment equivalent of 2.4 Dimond Centers (the largest mall in the state) at Point MacKenzie. Finally, after the State Legislative Budget and Audit Committee (LB&A) released its 2013 audit criticizing the unrealistic optimism of Wilbur Smith‘s population and toll forecast numbers, KABATA rehired the same firm which then subcontracted to Agnew::Beck to redo Borough population numbers. Agnew::Beck came up with 207,888 people in Mat Su by 2040. The Agnew::Beck figure differed significantly from HDR’s estimate prepared for the Mat-Su Borough transportation plan which put 7,177 people in 2035 at Point MacKenzie. KABATA’s consultants Wilbur Smith (now CDM Smith) put more than five times the number there by 2040 or 37,074. 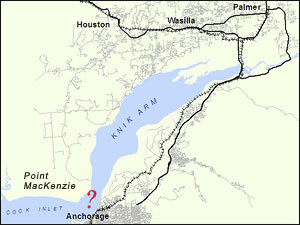 If Point MacKenzie had 37,074 inhabitants today it would be the state’s second largest city. The Anchorage Metropolitan Area Transportation Solution (AMATS) Technical and Policy Committees could have used their expertise to resolve these significant discrepancies; however, those groups never acknowledged the continual necessity for KABATA to lower Mat Su population numbers, was accompanied by KABATA’s corresponding need to project ever increasing population and job numbers at Point MacKenzie. With no real oversight from these important committees, KABATA’s plans showed that about twenty years after the bridge opened it would carry between 36,000 to 40,000 tolled trips a day. This was the “magic number” necessary to show the project had sufficient revenue to pay off the expected federal and state obligations on a $1 billion bridge. Having over $100 million in federal funds allowed KABATA to choose a consistent strategy: keep spending to make it appear that the project was moving forward. But the perceived extravagance of that spending, and the questionable sequence of activities, created the pushback that eroded political support for the project. One can say that “Free Money” in search of a project, just about guarantees an unsustainable project. In a 2006 decision, the KABATA Board of Directors set the pay of the Executive Director, Deputy Director, and new CFO at $129,000-$130,000 each, salaries larger than the Governor’s. The pay decision, made in executive session and not reflected in the minutes, drew unwelcome media attention to the new agency. http://www.alaskajournal.com/community/2006-10-08/knik-arm-bridge-board-gives-executives-pay-raises#.V8iJ7o-cF2s. Annual salaries for the project director and CF0 soon grew to about $160,000 + benefits. In 2011, KABTA’s financial plan included a $1.6 million upfront payment to KABATA as a “success fee”. government finance officer who learned about this proposed payment became a quiet ally of the critics because a “success fee” is known in venture capital as a payment to the original entrepreneurs when a firm goes public. It is inappropriate to give a “success fee” to well-paid public employees who are taking no financial risk on a public project. B. Demolish First, Financing Later or Never? The decision to acquire and demolish homes and business to clear right of way on Government Hill for the project was viewed by KABATA as a necessary step in making the project appear “shovel ready”. But for a major public project that kept being turned down for the $300 + million federal loan necessary to finance the project and never received the key environmental permits for construction, demolishing homes seemed to put the cart before the horse. Eventually, the Sourdough Lodge and three homes were demolished but faced with bad publicity, Governor Walker intervened, saying “let’s not go and start tearing down buildings and closing businesses” for a hypothetical project. KABATA apparently assumed it could create facts on the ground by acquiring right of way and demolishing structures. But this strategy instead stoked opposition from the Government Hill neighborhood that might otherwise have dissipated in the face of the apparently inevitable. The demolitions, and the decision of the Tesoro station owner to stop selling gas because his short term lease made it financially unfeasible to replace aging tanks, seemed to make the neighborhood, or at least the activist neighborhood critics, more determined to fight on. Despite KABATA’s web site hosting extensive links to project reports and promotional materials, the first single page budget for the project came from the critics, not the agency. In addition, KABATA’s first detailed financial plan for the project, authored by Citigroup, was handed to legislators by the critics, as it had not been included in the information packets for KABATA’s Legislative bills. KABATA routinely withheld information on the seven federal loan denials (often packaged as just a step in the process to skeptical reporters). This strategy allowed critics (and not the agency) to make public critical information first, thusputting KABATA on the defensive. Legislators, the media, and sometimes even the Governor’s office and Commissioner of Transportation became accustomed to hearing first from critics or the media about unfavorable project information rather than hearing it first from KABATA. KABATA also manipulated the discussion by ignoring pieces of information that could be used to critique the project. For example, KABATA’s plan was touse the existing A/C Couplet Bridge over Ship Creek and the Railroad Yard, even though the A/C Couplet Bridge is listed by the DOT&PF’s 2007 Bridge Inventory as “functionally obsolete.”It is also one of only 3 bridges in the state with the comment of “Fracture Critical”, meaning that it requires special inspections to ensure that it does not collapse. This weakness would have been exacerbated by increased traffic flows being projected by KABATA, but the issue was not addressed. Stephanie Kesler and Bob French, who had different terms as head of the Government Hills Community Council. Lois Epstein, who led the Alaska Transportation Priorities Project and then moved to an environmental group. A fourth person with a legal background participated mostly behind the scenes. They organized a much larger group of volunteers willing to write letters, testify at hearings, and contact public officials. In 2008 Jamie Kenworthy, who had managed a state agency, drafted a simple project budget for the Anchorage Assembly. KABATA CFO Kevin Hemenway contradicted Kenworthy by telling the Assembly that the private sector would take the risk for any toll shortfall. When a subsequent Public Records Act (PRA) request revealed that Hemenway had authored the federal loan application asserting the state would cover any toll shortfall, Kenworthy’s “brief assignment” turned into an eight year commitment to track KABATA finances, and he became the fifth core leader. Later, respected retired UAA economist Scott Goldsmith made public presentations on KABATA’s undocumented assumptions after KABATA repeatedly misconstrued his socio-economic projections and refused his requests to correct the misrepresentations. Concerned about the credibility of KABATA’s management of the project, the legislature in 2014 removed the project from the KABATA’s Board oversight. The legislature placed project management in the Department of Transportation but DOT&PF kept the same project leadership team in place, and there was little change in how the project was managed. The project changed its financial structure three times, which each new plan costing a few more millions for financial modeling by Citigroup and another traffic and revenue study by Wilbur Smith/CDM Smith. First, the project was a direct state financed project. In 2005, Congressman Don Young (R, AK) obtained a $453 million dollar Earmark for the Knik Arm Bridge and the Gravina Island Bridge near Ketchikan, AK, when he was chair of the House Transportation and Infrastructure Committee. There was substantial hope that Don Young and Senator Ted Stevens (R, AK) would be able to obtain more federal funding to supplement the typical 10% of project costs provided by the State of Alaska. Although the agency had briefed Commissioners and legislators, no project budget had ever been made public. The first financial plan done by Citigroup showing projected toll revenue and bond payments was sent to Jamie Kenworthy by a state official who told him “I see no reason why you shouldn’t have it.” Each page was marked “Draft” and “Confidential”; neither label summarizing a condition that would exempt the information from the Public Records Act. The hope for additional direct federal funding disappeared after Hurricane Katrina hit Louisiana in 2005, and after Don Young’s Earmark was the subject of national ridicule as the “Bridges to Nowhere”. The direct state financing plan was finally canceled after the project was turned down for a federal TIFIA loan and state officials were reluctant to recommend state revenue bonds to the legislature since the original KABATA legislation precluded a state guarantee. KABATA staff had discovered there was no market for state revenue bonds dependent on tolls without an underlying state guarantee. The second finance plan was a “public-private partnership” or P3. KABATA told legislators and the public that the private sector would share the risk or assume the full risk. What was explained to legislators only by critics was that the new KABATA bills required the state to guarantee 35 years of “availability payments” to the contractors who would then make the bond payments. So instead of being asked to guarantee a $1 billion plus in bonds for the project, the state was now being asked to guarantee 35 years of availability payments totaling a KABATA-estimated $3.2 Billion. Nevertheless, a bill offering a guarantee for the state to finance the project failed by only 1 vote in the House when two legislators were absent. The third and final finance plan was to cancel the P3 Partnership that promised each of the 3 finalists a million dollars, even if they were not selected. Revenue Commissioner and KABATA Board member Angela Rodell commissioned her former employer, the New York office of First Southwest, to do a five page study (despite requests, no backup numbers on toll revenue and bond payments were ever provided) showing a state financed option would be cheaper than a P3 partnership. The consistent theme of all finance plans was that the project was essentially free. When the project repeatedly failed to secure federal TIFIA loans, and critics kept insisting the state still held the downside risk, the plans kept being changed without ever being financed. The result of all the changes in project leadership and the finance plan was more confusion about the status of the project and an increasing lack of credibility with the media, the public, and, to a much lesser extent, the legislature. KABATA paid much higher salaries than regular Department of Transportation and other public employees. Contractor payments were large and do overs frequent. KABATA paid firms Wilbur Smith/CDM Smith and Citigroup over a million each time, to do at least 3 different versions of toll and revenue projections and financial plans. None proved credible to federal loan officials. Los Angeles law firm Nossaman and Associates was paid $1.2 M to put together a P3 partnership agreement which was soon canceled. Contractors and DOT&PF employees who watched while higher priority projects needed in the shorter term were starved for resources, grew privately acerbic about the double standard between the use of funds for KABATA and non-KABATA projects. Professionals, even those who still nominally supported the idea of a Bridge, were increasingly miffed by non-standard professional work. 9 individuals designated by the critics as “whistleblowers” because they had insider knowledge of the project and wanted to help behind the scenes. The first and most helpful whistleblower provided over a hundred hours of advice based on their knowledge of trip modeling and transportation planning in the Anchorage area. Former CIA manager Terry Maynard doing volunteer work for the Reston Virginia Citizens Association became concerned about the accuracy of Wilbur Smith traffic and toll projections for the Dulles Toll Road. After noting that the Knik Bridge Facts web site had documented similar problems with Wilbur Smith’s work in Alaska, Maynard contacted bridge critics. Using data from a study by Transportation Research Board, (a federal entity), Maynard published in 2012 an 81-page report showing Wilbur Smith’s track record was to overestimate toll revenue by over 114% for the first five years a US project was opened, or less than half the toll revenue projected was ever realized. He wrote a chapter on the Knik Bridge project. AMATS officials didn’t read Maynard’s report but some legislators and Muni Assembly members did. 3 “bond geeks” familiar with funding large public projects and credit markets reviewed Jamie Kenworthy and Bob French’s work that provided a number of editions of white papers on bridge costs and an alternative spreadsheet of the project using the same assumptions and structure of Citigroup’s plan. A number of former and current employees of KABATA and the DOT&PF and planners with the state and the Muni did not step out of their government role, but took the time to explain the planning process, budget information, and traffic analysis to the critics. A number of times at public meetings, bridge critics would challenge the numbers or process behind the project and a public official or employee would respond to refute or deflect the criticism. After the meeting, the same public employee in the elevator or parking lot would encourage a bridge critic to keep raising questions, provide more information, and sometimes even offer a private opinion on the project’s lack of merit. This disjoint between public statements of government employees and their private opinions was sometimes almost surreal. These conversations encouraged the critics to stay on task even as it provided discouraging feedback about how government functions when professionals assessing information felt the need to defer their judgments to Mayor Sullivan, Governor Parnell, and other elected officials who had already endorsed the project. 6. Critics stepped in, when AMATS proved unwilling to examine the project’s finances. How AMATS handled the bridge project resulted in a sorry record for the Muni-State planning organization. Planners from AMATS, the state, and Mat Su had almost endless numbers of meetings to try to resolve different population and employment numbers between themselves and between KABATA’s numbers and theirs. While AMATS planning staff insisted they did not have the time or resources to look into the reality of whether the large agricultural zoning at Point MacKenzie could even support the population and job numbers projected by KABATA, clearly AMATS needed to know whether the Bridge would be dumping less than 10,000 trips a day downtown in 2035 (an HDR-Mat Su number that surfaced from a PRA request), 16,800 trips a day (a number HDR estimated from earlier work on the Highway to Highway project) or 36,600 trips according to KABATA. But AMATS staff did not have the backbone, expertise, or political freedom to assess the reality of KABATA’s financial numbers. Instead they inserted in the 2035 Long Range Transportation Plan (LRTP) a convenient fiction showing the project would have no fiscal impact on non-bridge projects planned for the Anchorage area. AMATS receives about $25 million a year in state and federal transportation funding. Critics estimated that the toll shortfall for the first ten years would be more than AMATS funding. Who could believe that the $1-2 billion project would not affect local funding? In re-certifying AMATS in 2011 as a regional planning agency eligible for federal planning funds, the Federal Highway Administration (FHWA) Division Administrator criticized AMATS for not playing a stronger role to ensure consistent planning assumptions between KABATA, the state, the Mat Su, and AMATS. The USDOT Division Administrator wrote that “in order to make a complete determination that the updated (2035) LRTP is financially constrained, AMATS must determine that the sources and levels of funding for all projects are reasonable. Due to the size of the KAC (Knik Arm Crossing) project relative to a typical AMATS project, it is particularly important that the best available cost and revenue estimates by source from the KAC project be included in the next plan revision.” This was never done. When critics in 2011 made presentations to every Anchorage community council about the 2035 draft LRTP, no one questioned that the large project would affect the ability of AMATS to fund other projects, even those where existing demands to accommodate traffic and improve safety should have made those other projects a higher priority than a billion dollar plus bridge to vacant land. Whether pro or anti bridge, Anchorage Assembly members did not accept AMATS’ judgment that the bridge would not impact local transportation funding. In adopting the 2035 LRTP in 2011, a 9-2 Assembly vote sought to “wall off” Bridge finances from future AMATS funding. Nevertheless, the Bridge stayed in the LRTP and it remained in the current Statewide Transportation Improvement Plan without any further funding commitments. While AMATS committees allowed a briefing by critics comparing the numbers being used in preparing the 2035 MTP and KABATA numbers, AMATS didn’t follow up. Goldsmith and Kenworthy signed a Memorandum of Understanding with the Muni to provide a free analysis of KABATA vs. non-KABATA socio-economic data in return for AMATS traffic information. Goldsmith and Kenworthy provided comparisons of data and maps down to the neighborhood level of differences in population and employment numbers in the Mat Su. After 3 emails to AMATS Coordinator Craig Lyon, no briefing was ever scheduled for Goldsmith and Kenworthy to present this information to the AMATS Technical or Policy Committees. Clearly, AMATS staff didn’t care, didn’t know, didn’t want to know, or did not have the willingness to try to reconcile their data and traffic projections with KABATA’s data. In contrast, the federal loan analysts from the US Department of Transportation clearly were worried about the overly optimistic numbers KABATA used to predict that there would be sufficient toll revenues to pay off the prospective loan. In their last loan rejection letter, of 2/9/16 the CFO of the US Department of Transportation, Shoshana Lew cited the “aggressive assumptions in your traffic and revenue study” as a key reason for the loan denial. The critics were not surprised by this conclusion but for 10 years AMATS was largely missing in action on this important question because of the unwillingness of planners and staff to stand up to the elected officials on the Policy Committee and their representatives who supported the project. Bridge stories until about 2012 largely had a he said/she said structure and reader comments were generally split between bridge boosters and critics. But as the loan denials accumulated, the 2013 LB&A audit was released, and reporters got used to receiving accurate project information on budget and socio-economic data from the critics, the media’s tone sharpened and they viewed the critics as information allies. And reader comments and letters to the editor shifted overwhelmingly against the project. Reporters now asked critics the two questions they could not answer, because it asked critics to know the mind and motives of bridge proponents. Why is this project still spending money? Where is the support for this really coming from? Critics had done research on the pattern of land ownership at Point MacKenzie. The media had disclosed in 2004 land purchases by Congressman Don Young’s son in law Art Nelson and Senator Stevens aide Trevor McCabe of 60 acres of Point MacKenzie land made just before Young announced the original $223 M earmark for the Bridge. But critics found no later large land purchases at Point MacKenzie that would represent the “smoking gun” of any one significant private economic interest that could explain the push for the bridge. The largest landholders in the Point MacKenzie area were the state, the Mat Su Borough, and the University of Alaska. KABATA Board Chair Mike Foster wrote the University of Alaska President a letter to point out the amount of University land in the area that would benefit from the bridge and suggested he rein in UAA Professor Scott Goldsmith’s opposition to the project. The President was amused and at a social function handed a copy of the letter to Goldsmith. As media reporting and editorials turned against the project, critics hoped forlornly that a giant expose could move the legislature to kill the project. But over the 12 years the Bridge project continued, the revenue model for print journalism continued to deteriorate with the result that few reporters had less time than ever to cover large, complicated projects. One story that at least one critic thought should have killed the project came in 2012. A key summary of all KABATA financial plans is a bond cover ratio showing that there was enough revenue to cover bond payments and other fixed payments. Of at least 12 variations of the finance plans done by Citigroup, that ratio varied between 1.25-1.40 or about $1.35 of revenue was expected to pay a dollar of expenses. The critics discovered that the consultants were counting on up to 50,000 tolled trips a day to cross the Bridge within 30 years after the 2 lane bridge was open. The official FHWA Highway Capacity Manual estimates about 22,500 vehicles are the maximum capacity for a restricted 2 lane highway at an acceptable service level. So the necessary bond cover ratio KABATA was counting on in its loan application to the feds used at least 4 lanes of revenue to cross a 2 lane bridge. When KABATA was given the chance to refute how the ratio was constructed and declined, this information was forwarded to the federal officials assessing the KABATA loan. Once the “4 lanes of revenue, 2 lanes of cost” problem was made public, KABATA shifted to a 2 phase project, with Phase 2 of the project costing about $500 million to expand the bridge to 4 lanes “when traffic warranted” with the project cost rising now to $1.5 billion. But the timing of counting over 22,500 trips a day to provide the revenue for a 2 lane bridge continued to be a problem. Critics continued to call this extra revenue “impossibly derived” rather than “fraud,” but no member of the media, AMATS or legislator ever raised the issue. Despite the increasingly critical media attention to the project, it became clear that people who wanted the bridge would not be influenced by factual critiques of the project. In particular, legislative support seemed stronger than was reflected in the media or polling. The legislature proved a lagging indicator of declining support for the project. Key reasons for continuing legislative support were leadership positions being held by Mat-Su Legislators, the strength of the pro-development bent of the Republican-led majority, the influence of the Associated General Contractors and to a lesser extent organized labor in pushing for its inclusion in a large capital budget, and even a KABATA budget which could afford a full time “legislative liaison” to lobby for the project In contrast, critics had the time and budget (on their own dime) to visit the capital at most two or three times a year. Most of the critics were personally more on the left than the right of Alaska politics though, when speaking for the group, bridge critics constantly reminded themselves that it made little sense to link the bridge fight with other contentious issues. The tactics of the critics was informed by two Ivan Moore polls (paid for by critics) that showed that over a third of Bridge skeptics were small government, anti-spending Republicans, many based in the Mat-Su, Kenai, and especially Southeast Alaska. Men favored the Bridge by 10 points more than women. One of the initial key critiques of the bridge was negative impacts on the health of endangered Cook Inlet beluga whale and salmon caused the the construction and existence of the mile long earth causeways into the inlet that would constrict Knik Arm. But polling and conversations with decision makers soon led critics to focus their key arguments on the poor economics of the project. While letter writers often used the Bridge as their best example of misplaced budget priorities (laying off teachers vs. an unneeded Bridge, etc. ), Bridge critics tried hard not to link their opposition to the project with broader political agendas on either side. Democrats Les Gara (D-Downtown) and Senator Berta Gardner (D-Midtown) were usually the biggest public bridge critics and put their comments in the misplaced priorities context. Rep Mia Costello (R-Sand Lake) was outspoken on the need for the Department of Transportation to take over the project from KABATA. Other key allies in getting information out about the potential state liability for the project were Senator Bert Steadman (R-Sitka), Senate Finance Member Danny Olson (D-Golovin) and former Rep Eric Feige (R-Chickaloon) who lost his 2014 primary to a candidate backed by the unions and the Associated General Contractors. Despite a minority of legislators from both sides of the aisle being critical of the project, at the end of the 2014 session after a bid to offer the project a direct state guarantee failed by two votes in the House, the project was moved to DOT&PF and the legislative majority overwhelming passed a new bill that was described as a “new plan” supported even by former project critics Reps Mike Hawker (R- South Anchorage) and Mia Costello. While the project remained contingent on a $380 M federal loan for about one third of the project costs, it now contained an unlimited “moral obligation” language and had a finance plan dependent on the same high toll and revenue numbers the federal loan officials later rejected. 9. Facts really do matter. Eventually as noted above, the misrepresentations and assertions that counter common sense caught up with Bridge Boosters. When one side of an argument is spouting hyperbole without supporting data, and the other is citing numbers backed up by innumerable quotes and common sense examples, the preponderance of evidence becomes an important factor. Bridge proponents were often caught saying that using the bridge would cut the travel time from Anchorage to Talkeetna or Fairbanks. However, KABATA’s own data showed that without the half Billion dollars to build the Pt. MacKenzie to Houston road (a cost not included in the bridge finance plans or cost estimates, and not even mentioned in the Statewide Transportation Improvement Plan) it would be nearly 12 minutes faster, to NOT take the bridge. Not taking the bridge also avoids paying $2000 to $4832 (in 2051) per year in tolls. Even if the bridge and the Point MacKenzie to Houston road was built, KABATA’s own maps showed that it would be only 7 minutes faster to Talkeetna. It can be difficult to explain the manipulations that KABATA’s consultants used to try to justify how they were going to fit 35,000 average daily trips on a 2 lane bridge, but Alaska commuters from the Mat-Su to Anchorage easily understand that fitting the same traffic that they see every day on a 4 lane Glenn highway west of Eklutna, just won’t fit on that 2 lane bridge. Bridge Critics wondered over the years whether their critiques allowed KABATA to improve its plans and predictions. However, in the end, the continual gyrations and tortured “logic” used to support those ever-changing assumptions probably undermined KABATA’s credibility. An Environmental Impact Statement is required for large projects utilizing federal funding by the 1970 National Environmental Policy Act, or NEPA. The pieces and steps required by the law lead to a fairly drawn out process, and it is critically important to get involved at the earliest stage possible. Bridge critics nearly missed an initial meeting that helped establish the Government Hill Community Council as a “Consulting Party” with some rights and responsibilities that would have been lost if we had not attended those initial meetings. From the earliest “project scoping” meetings, to “public meetings”, to “public comment periods” on each of the scoping, draft EIS, Final EIS, and Record of Decision and any Programmatic Agreement, Memorandum of Agreements, etc. are essentially a series of “check lists”, and to establish legal basis, it is important to participate in those meetings and to provide comments, even if you have no intention of filing suit. B. Data generated with public dollars is public information. Find out the requirements for a Freedom of Information Act (FOIA) and don’t be afraid to file a FOIA request when you are being stonewalled. C. Project consultants get paid to generate favorable data. Getting background or supporting information for that “unusual seeming” data may be a good candidate for a FOIA request. D. “Need” is a constantly mutating beast. For a project of questionable benefits or need, there can often be manipulation of the “Need” statements of the EIS, and questions about the underlying assumptions and justifications should always be included in public comments. E. “Alternative routes” means all possible routes. High costs alone cannot be used as a reason to avoid evaluating alternate routes. F. Alternative options always include the “no build” option. G. Political patronage and pressure can be huge obstacles to good public process. With large amounts of Mat-Su Borough owned land, the Mat-Su delegation’s desire to build things, and a simple concept of opening up empty land to new development, the Knik Arm Bridge and Toll Authority was established and funded with a single purpose, to build a bridge across Knik Arm. The initial $223 million “Earmark” from Don Young for the Knik Arm Bridge furthered that goal and provided KABATA with funding that didn’t have to fight with other state agencies to spend. That the Mat-Su’s Republican legislators were in position of power, where they could both lean on reluctant members, as well as act as gate-keepers for money being spent in the districts of those reluctant members probably did more than almost anything else in keeping such an unjustifiable project alive. The critics remain grateful to the Walker administration for canceling the project even as they are still somewhat incredulous it survived so long. More importantly, from what we have learned about how state government spent money during this project, we are not sanguine about how government in Alaska functions. Most of the critics believe that if development continues, a bridge might be built across Knik Arm sometime in the next 30-70 years. All of us believe that a number of institutional improvements are necessary now if Alaska is to improve its oversight of megaprojects and do a better job spending public funds. AMATS needs to be a more professional planning organization driven more by fact-based, coordinated socio-economic data and less by politics. Other regions of the country have an executive director with a transportation planning background. AMATS lead is a coordinator of the state and Muni project transportation agendas and the organization is less leading a regional transportation agenda than coordinating the existing state and Muni agendas. DOT&PF has largely functioned as its own internal, independent empire for a long time. DOT&PF is used to telling the legislators and the public which projects are “shovel ready” or not, which projects are scheduled when in the Statewide Improvement Plan, and using the complicated federal and state budget rules to justify the timing of all projects. All $223 million in the original Earmark set aside for the bridge could have been transferred after 2007 to any other state project which was eligible for federal transportation dollars. But over $100 million was spent for the bridge with DOT&PF managing (some might say manipulating) information and the statewide plan, so it never had to indicate any projects which had been postponed or canceled because of bridge spending. DOT&PF also never admitted that bridge spending and pulling engineers off other projects had any impact at all on what projects went to bid. The continuing result is politicians do not understand their choices and the department controls the agenda and timing of launched projects largely regardless of administration. For example, on July 1, 2016 Alaska was eligible to draw down more reallocated federal dollars than the state had the 10% match for. Despite a legislative hearing on the subject, the exact amount of missing match has not been made public nor necessarily even known to the legislature, the Transportation Commissioner or the Governor. Our current analysis is that the missing state 10% match is between $25-40 million. If DOT&PF had better priorities and prepared more shovel ready projects that realistically can be built, clearly identified the match needed to the legislature, and had wasted less money on the Knik Arm Crossing and other unrealistic projects like the road to Ambler, at least $250 million more in projects could have been bid this construction season. In this current recession, that $250 million number represents a political and bureaucratic failure largely programmed by how DOT&PF continues to function. As a group, elected officials and their staffs do not do enough homework and are driven too much by their understanding of the politics involved rather than by any grasp of key project details. While critics found some outstanding exceptions to this judgment, there remain too many officeholders of both parties and too many holdovers of high level staff who have insufficient courage, analytical ability, willingness to understand large ticket items, and general know-how to adequately do their job.